Blake is a 8 month old Boxer that presented as an emergency after being hit by a car. 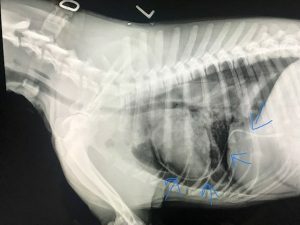 He sustained multiple injuries to include lacerations on his head and left rear leg, fractured left scapula, and blunt force trauma to the chest that resulted in pulmonary contusions and pneumothorax. Pulmonary contusions occur when trauma to the chest causes the air spaces to fill with blood and fluid–a reaction to inflammation(see red outline). 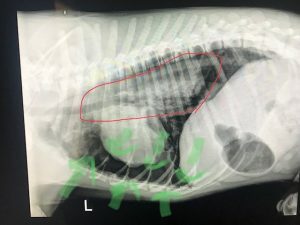 Pneumothorax is the term used to describe the accumulation of air in the chest cavity, specifically between the lung and chest wall(see green arrows). Blunt force trauma(hit by car) is a common cause for both of these conditions. The result is a pet that has difficulty breathing, rapid/shallow breathing, pale or sometimes bluish color to gums and tongue. While radiographs often help to determine the severity of this type of trauma, it is important to stabilize these patients prior to pursuing any stressful diagnostics. Upon presentation, an IV catheter was placed and Blake supplied with oxygen via face mask. He was given injectable pain medication as well as a low dose sedative o help keep him calm. To help counter the effects of shock, he was given IV fluids. Once he was more stable, he was taken for radiographs. It was determined that the severity of Blake’s injuries would be best managed with an indwelling chest tube. This would allow evacuation of air periodically, giving his lungs time to heal from the injuries. Blake’s chest tube(blue arrows) was siphoned every 3 to 4 hours until minimal air was drawn from the tube. While the hope was to keep Blake on oxygen via nasal cannula, he was very intolerable of the device. Because of this, his oxygen saturation was measured hourly until it was determined to be stable. Blake was placed on a regimen of antibiotics, pain medications, and herbal supplements to help manage his pain, prevent any secondary infection, and control bleeding into his chest cavity. Within 48 hours, Blake had made an impressive recovery. Suctioning of the chest tube was becoming less frequent, producing less air at each occurrence. Within 4 days recheck radiographs determined marked improvement. Blake’s attitude was back to a normal puppy. He was discharged to his owners wagging his nubby tail, saying goodbye to everyone on his way home.